Remarkable Foreside built with impressive style and sophistication. Feel the ambiance and elegance of this colonial style home that sits on 1.2 acres and is located in quiet neighborhood off of Foreside Rd. The first floor offers an open concept kitchen with custom cabinetry, tile work, granite countertops and stainless appliances. 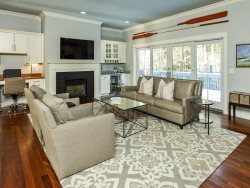 Home includes a two story field stone fireplace, media and theater room, a private deck for cookouts and for all to enjoy the summer days and evenings.